Pressure on Sydney’s Town Hall train station has grown significantly during peak periods due to a 23 per cent surge in passengers in just three years, raising the prospect of staff limiting access to platforms more often to avoid severe overcrowding. Sydney’s 163-year-old train network is struggling under the demands of what the government describes as “an explosion in demand”. Last year passengers took more than 413 million journeys on the rail system, up 38 per cent from 300 million in 2013. Purchasing 17 new trains is good, but it will barely hit the sides without massive investments in new track and station capacity. How’s the ‘vibrancy’, Sydney? 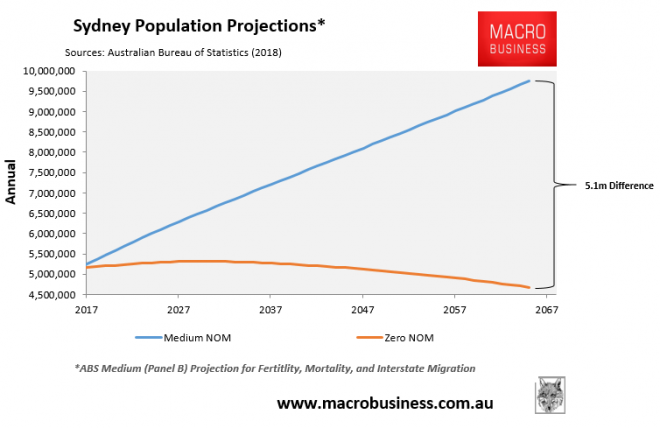 And how much worse will liveability get when the city’s population expands to around 10 million? This is a disaster in the making. Cut immigration. I hear you, and to Sydneysiders I say, there will never be action to limit immigration. Never. Just leave and watch the catastrophe unfold from afar. Until it reaches capacity, and then what? Build in acceptable accident rate? Lower safety standards? Thats the thing with trains, they don’t… London underground has one every minute at peak. Thats why trains are so critical for big city development. The numbers they can move quickly, and efficiently, is mind boggling. the trains from the central coast to Sydney got timetabled to take 10 minutes longer a decade ago because the rail network was already exceeding the capacity of the system. A single line can handle a train a minute, the problem is half a dozen or more lines are shoehorned into the same few at the centre and each line can do every 10-15 minutes at best. Harbour bridge has a maximum amount of trains it can take and it hit that ages ago leaving an entire part of Sydney limited to a fixed amount of trains. bjw678 – trains from the Central Coast/Newcastle are substantially slower than steam engines ~110 years ago! (20-30 minutes I have been told by someone in the know) That is down to the quality of tracks. RT, that is simplistic crap. Lived in HK for 5 yrs and the trains there pass through every minute and the peak periods last for a min 4 hrs morning and the arvo, and it’s jammed packed on the MTR. Btw, by peak, I mean full capacity. The lull period lasts around 3 hrs and then you have no probs getting a seat. Admittedly it’s nearly 15 years since the wife did any work with Sydney trains, but back then the limiting factor in how many trains they could put on (ie: frequency) was signalling, not an easy fix. Number of carriages is also limited by the length of some CBD stations – again, not an easy fix (this is a problem with some London Tube stations as well). With traffic in the seemingly ever-expanding major metropolis unbearable, the public figure had reached breaking point. Something needed to be done to ease congestion and make not just his daily commute, but also those of countless other inhabitants of the city he called home, a far less stressful affair. As the man made his way to his place of work one morning he jotted down an idea which simply came to him in a flash of inspiration (there was no need for him to steer the vehicle in which he was traveling so his hands were free); an alternative means of navigating from point A to Point B which would take the passenger – wait for it – …underground! Yes! By building a network of tunnels under the city, surely it would be possible to ease the stifling congestion above ground and build a better way for those commuting on a daily basis to reach their place of work? Imagine that for a moment. A network of subterranean tunnels criss-crossing the city, filled with commuters moving quickly and with a minimum of hassle from their homes to their places of work and back again. This was futuristic stuff. The cost of the tunnel would be measured in the millions (not billions), and construction would begin underneath land already owned making the initial exercise fairly simple to get under off the ground. Initially, despite concerns from neighbours about undermining and vibrations causing subsidence of nearby buildings, construction began on a short tunnel which was to prove the idea viable. Once the public had bought into this seemingly fanciful idea, it would be easy to raise both the capital and the support necessary for its expansion. Trial runs were carried out (to much fanfare, it has to be noted) while construction was still under way, with a series of celebrities attending and taking their turn in being transported the short distance along the length of the rudimentary tunnel. That’s right, 158 years ago, with a then-astronomical 200,000 people entering the City of London on foot each day (alongside the inhabitants of countless carts, cabs and omnibuses), Charles Pearson (a former Member of the British Parliament) hit upon the revolutionary idea of an underground system of tunnels which would ferry commuters back and forth between work and home and around the City, thus alleviating congestion on the streets above. The eminent engineer, Sir John Fowler, a specialist in railway and railway infrastructure construction, was tasked with making Pearson’s dream a reality and The Metropolitan Railway was born. The initial 3.75 mile line was opened to the public on January 10, 1863, carrying some 38,000 passengers that day and 9.5 million during its first year of operation. The following year, that number increased to 12 million. Fundamentally, the real question is why, in today’s world, thousands upon thousands of people are still traipsing into the city every day to work. But I love this Tweet Dear @elonmusk! Metro line 3 in Budapest has a train per every 150 sec in peak hours, capacity is 28200 ppl per hour. To provide this capacity with 5-seat cars, you would need 3 Teslas in every 2 seconds (94 cars/min). How is this is an innovation and not a scam? “Just leave and watch the catastrophe unfold from afar. Same, in 2013. To Melbourne though, which is on the same trajectory, doh! Where did you end up Ortega? In Sydney which uses the Opal card you can broadly tell who are Australian born by their appearance, language skills, age, time of day & destinations. Or who are are temporary resident visa holders or migrant Tourist: Visitors. Australian by their appearance, voice/ language skills & behaviour. (if not frauding an Australian concession card which they do with easily purchased fake Australia identity cards – student ID, drivers licences etc $50 or so anywhere). So as a very broad and rough generalisation – based on appearance, dress, language skills etc & locations to & from etc – any migrant on a black Opal card will most likely be a migrant Temporary Resident or Tourist Visitor guestworker. The time of day is important also. The unusual crush load & peaks are very much the new migrant enclave concentrations and those migrant guestworkers cash economy illegal job / travel patterns. Then a steady increase in the late evening into the early hours as they return back from their illegal services, cleaning, fast food, vice or other work. The migrants swirl around or actually step over the Australian homeless camped outside on the footpath / town hall & now QVB George street light rail stretch. Watch them tap on or off or as they top up their Opal card and how. Maybe 1 in 5 people are Australian. 1 in 5 are migrant PR on concession student, pension & welfare cards. 3 in 5 are migrant non Australians on black Opal card. Late evening it’s almost 4 in 5. 90% are migrant TR doing double jobs etc. no English, usually shouting in phone conversation, the buses packed full of sweaty rural Asian, Nepalese, Bangladesh & Malay or Chinese migrant Guestworkers. Go try & see for yourself. 4 in 5 are migrant TR Asian, it’s new Migrant slum as the far west, inner West and now south suburbs are enveloped in conversion of ex Australian dwellings into migrant only housing. Asian / you just have to see for yourself the flood of Asians coming down the steps like a Tsunami, to then cross the road to crawl into their squalid tower block cage housing. 3 in 5 are migrant TR Asian, lot of old sick pensioner Chinese on PR concession cards, either real or borrowed fake. 4 in 5 are migrant TR Asian Indian Malay Nepalese Bangladeshi Arab – rare to see an Australian. Maybe 1 in 100 on the station. Even more rare to see an Australian. Dominated by Indians, TR students etc & many sick looking ‘wheelchair assisted’ Indian mothers on either on PR concession cards or as tourist visitors. The whole place like a film studio mock of our migrant version of blade runner but with Muslims. Shaved headed Lebanese gangs, mixed with Arab & East Asians in full burkas. Some of the migrant TR pay cash for their Opal as they live in a cash economy & try to minimise any identification checking. But many use the student of other credit card they are allowed to have. So their identity & resident or not attributes of the Opal public transport use can be matched. They also buy very low balances $20 etc as many live week to week or try to avoid tapping on and off on the unsupervised western & south train stations. Most Australians & migrant PR will use a credit card – and that has name & details associated with that. ➡️ They would have an instant & reasonably accurate ‘usage of Public transport’ by residents or non resident migrants indicator and capacity planning tool. If everyone had to ‘register’ for an opal card in a linked identity, I suggest it would show most of the overload is migrant guestworkers. or 1 in every 4 people. But up to half the users of public transport and as above / south & west they appear to be the majority of users of public transport. Our public transport capacity increases & new infrastructure projects are largely funded by the Australian taxpayer – but these migrant guestworkers work in the cash economy and pay little or no tax. I think the answer is all non residents should be required to have their own bright Orange 🈚️ card and be registered. And they should pay at least double what an Australian citizen or PR pays. Then we really get to the heart of the issue in what’s overloading our public transport and this migrant surge : crush load demand. ➡️ The 2.4 million migrant guestworkers in Australia should fund or at least contribute to the provision of extra infrastructure capacity & services. I read your post and you are a right f***it. You should be carrying your own special identity card and ankle tracker as you scurry about being ‘Australian’. What station did you get on at, Clyburn? I hope someone on the train manages to put you on your southern cross trampstamp. Can I request the moderator delete his post? @JamesC: you know I don’t actually agree with everything Mike posts and some of it is really a bit over the top. But learn this: it’s called free speech and in an atmosphere where 95% of Government policy is never discussed with the electorate and there is no end of people telling those with a particular point of view to shut their mouths, it is the one great thing about this country. Now can I request that you exit Australia and go someplace where you can enjoy all the censorship you like, such as Saudi Arabia,China or North Korea? Perhaps counter mike’s claims with your version of the facts rather than abusing him and proposing censorship. SJW’s don’t deal in facts. You are oppressing his feels. projecting desired characteristics based on one’s Opal card, speech level, etc is not observant. Because someone’s narrative is suitable, it does not make it right. Can be outright wrong. But you know that. Only “some” is a bit over the top? You are smart enough to know that Mike pulls the numbers out of his R-se and then draws long tall conclusions. I mean, the entertainment level is excellent, fact have not seen presence there. But remember that free speech is also calling someone’s bull a bull, a spade a spade and a kettle black. Calling a ricist a riceist is free speech too. You understand that opposite of conjury is another conjury and that opposite of facts is *not* ‘alternative facts’ but irreality or fantasy. To counter Mike’s clam one has to develop another conjury and fantasy. JamesC you clearly live in your ivory tower somewhere in the eastern suburbs or lower north shore. I recently returned to Parramatta after 4 years absence and observed massive changes in demographics. I sat at the station and observed half the population was Indian with the rest being Chinese and other non Caucasians. I have many friends from all over but even i was astonished at how quickly things changed with most of it recent newcomers in the last 5 years. We cannot keep stuffing more and more people into sydney. Its not the colour of ones skin but the sheer numbers bordering on madness. This is indeed lovely laced! sat at the station and observed half the population was Indian with the rest being Chinese and other non Caucasians. “To counter Mike’s clam one has to develop another conjury and fantasy. To counter mike’s claims, all you need to do is provide the actual facts, if his are wrong. At that point it becomes clear he is spouting BS. Claiming that his is a fantasy is also a fantasy without providing any evidence. If someone claims that there are purple-yelow checkered wild goats roaming up in the remote mountains, would you accept that without a shred of evidence? What if they claimed that the goats are green? The onus of supporting evidence for any claim lies in the claim maker. Mike’s pieces are just a poor attempt to make alternative to Reus. The fun with Reus is that she is quite laconic. Why should any objective & unbiased statement of fact & reality be censored? The article/topic is crush load of Sydney transport & trains including Mascot Chinese new migrants etc. You either didn’t read it or had no issue with that. My comment was to the point that we have crush load and congestion across the wider network and all those observations are genuine and easily verified. The 2nd point was that the Opal card with registration and tracking would provide an exact view of that including user pays system – currently the migrant guestworkers – many who work illegally or innthd cash economy do not provide funding for transport infrastructure. What facts are even in dispute? We have 2.3 million TR or non residents. Dec 2018. Easily checked on DHA or Visasure or many other sources. 89% are third world origin & unskilled. Their country of origin including a third of the NZ SCV being of third world origin are all listed. We have 64k Overstayers, same..
We have an estimated 440k migrant tourist visitors working illegally (5% of the 8.8 million tourist visitors yearly – Parliamentary submission by ABF. That’s 2.8 million non residents. The vast majority – over 2.4 million third world unskilled migrant guestworkers, at least half in visa breach or on a visa pretext, only here to work illegally. The ABS, DHA & many other sources including Macrobusiness in many articles provide information on their concentration. 86% plus Sydney / Melbourne concentration. And the other 400,000 are elsewhere. Then we get exactly the crush load, new and unusual travel leaks and congestion the article describes. And any observation in traveling in theses areas will confirm. So my suggested answer is to analyse map and charge those migrant guestworkers in funding additional capacity investment. Neither should fiction and fantasy be censored. Censorshi should only be used to maintain decorum. Maintain the rage Mike, I appreciate your posts and concur with all your comments re Sydney transport network. So you endorse his views that every migrant is rorting the system? Is legal migration a crime? Your missing the point joel. The point is that he is seems to be a champion for the user pays system and from his point of view the user is not paying. Please try to have a rational discussion without getting offended. This homeboy is just another hater of vibrancy who struggles with his move into irrelevancy within our great society! It’s NOT OK to be white freak!! I thought the north shore line was bad with all those mainland Chinese targeted adds around Lindfield, but I had the shock of my life when I caught the northern line to pick up my car from it’s service. I was pretty much the only white Aussie on the train. Felt like I was in a foreign country, like a cross between Beijing and Bangalore. It is safe to say I wouldn’t even dream of catching the Bankstown line which I would consider an even worse version of hell. I have only been back for a few years since I was overseas. My first stop was Canberra but my boss was such a knob that I wanted out – and here is the kicker – I couldn’t find a job since I hadnt been in the market long enough – so I moved to Sydney. If SHTF of an economy which goes on the blink – then the major cities are probably the best place to be to weather a recession no? “Hadn’t been in the market long enough”. Yeah, I want haters of vibrancy banned and haters of our booming housing market exiled too. You talk either down YOU ARE BANNED!! Lots of love for you from me buddy, just want you to know that. The day that rants like Mike’s are moderated will be the day that MB dies as an independent non-conforming source of analysis and opinion. I hope you see that above statement is unlike a lot of intellectual you’ve said before. Ask yourself what is exact opposite of calling everything and anything one glances – a racism? Djenka – everyone can read what mike writes and then internally filter it and decide how much is factual, how much is is roughly-factual, how much is just a plausible hypothesis and how much is just mikey mouthing off (ie “opinion”). We are all big enough and smart enough to do this. Except JimmyC, but JimmyC can bugger off home to mummy. Now apply what is given to Mike’s rant equally same to JimmyC’s rant. JimmyC’s rant is pure opinion. His opinion is (in essence) that MB, in its current form, should be shut down. My opinion is that JimmyC should sod off. I had the courtesy to state this directly. Thanks for facilitating this deconstruction, Djenka, it’s actually been quite useful. I hope you will not allow inconvenience of one opinion to cloud the perspective of a convenient opinion. If an opinion is convenient, factoids and fantasies don’t change to facts. When MikeB says ” Can I request the moderator delete his post?” or “I read your post and you are a right f***it.” we will respond as we have to JamesC. Up till now he has voiced his opinion, not asked for others opinions to be removed while offering none of his own and outright abusing people. moderation policy is what makes the discussion factual (or emotional) and with decorum (or without). my view is that if any opinion is allowed – any opinion on that opinion is also allowed, inclusive of the calls to moderate any opinion. Then stop complaining about our opinion on the opinion to moderate the opinion, as that is just as valid. if you read my comments, i did not complain, I reacted to unequal treatment of convenient fantasy and an inconvenient tantrum rant, both being a fact-void opinions. But I take from your response that you see Mike’s fantasy essays and JC’s tantrum rant – essentially in the same loony bucket, for different reasons. you are clearly retarded, and don’t deserve to post on MB if you can’t see the difference between the 2 posts. Does that help clarify the difference. So it is not ok for JC to call for censoring but it is ok for you? Don’t worry mate… everything will be right… slow,,, but right. Hey JimmyC can I suggest you go any buy a membership before slagging people off? No censorship. Less ad hominem (though a bit can be entertaining). More facts. Oh Kodiak you are mellowing. My comments are objective & fact based. The article/topic is crush load of Sydney transport & trains including Mascot / Chinese new migrants etc. You either didn’t read it, or had no issue with that. My comment was to the point that we have crush load and congestion across the wider network and all those observations are genuine, and easily verified. Who is challenging these facts? ▪️We do have 2.3 million TR or non residents. Dec 2018. Easily checked on DHA or Visasure or many other sources. ▪️89% are third world origin & unskilled. Their visa category & country of origin including a third of the NZ SCV being of third world origin are all listed. ▪️ We have 64k Overstayers, fact. ▪️And we have an estimated 440k migrant tourist visitors working illegally (5% of the 8.8 million tourist visitors yearly – Parliamentary submission by ABF. These are baseline facts. Not my opinion. Facts with easily checked verifiable references. Again the evidence of that is on Macrobusiness itself or the extensive media on visa racketeering, visa breach 75% or 505,000 of the 672,000 foreign students work illegally, skilled visa, bridging & protection visa, working holiday visa & so on fraud. At least half are in Australian on a pretext visa or in visa breach. The ABS, DHA & many other sources including Macrobusiness in many articles provide information on their concentration. 86% plus in Sydney / Melbourne concentration. It’s suspected to be higher, but using 86%. 🔹That’s 1 in 4 people. 🔹That’s 1 in 5 people. And the other 400,000 migrant guestworkers are elsewhere. Simple calm clear objective facts, with extensive verification. and the congestion the article describes. And again – any observation in traveling in these areas will confirm. So my suggested answer was to analyse map and charge those migrant guestworkers (many who work illegally and make no taxation or social infrastructure contribution) in funding any additional capacity investment. That’s fair, reasonable and it’s all based on facts. Brilliant. Why not have a higher salary floor for foreign workers in NSW? “We want more people to call the Northern Territory home. We produce half the nation’s exports from 5 per cent of the population. More people equals more jobs,” NT chief minister Michael Gunner said. Completely insane! Why is the unemployment rate in India at a 45 year high? More people equals more jobs. Yep. Simpsons had this pegged decades ago as well. Buying more trains and expanding stations and doing track work are all communist-style wastes of precious taxpayer money (stamp duty revenue). Let the market sort it out with a capitalist solution – raise the cost of fares to by at least 50%. Any fare that is still under $14 after a 50% increase should be bumped up to $14. I 100% guarantee that congestion on trains and platforms will ease. If for some unforeseen reason congestion persists (or comes back), another 50% rise should be implemented (all fares will be $20 or above). Dude, stop being a good profit maximising capitalist and get back to being a commie whinging about unfairness! ^^ Quit with your gender bias Hairold! Stop funding road tunnels. Charge foreigners $40/day for train travel and $100/day for parking. Unless they start installing human catapults at mascot pointed at the city, the congestion won’t get any better. Fare evasion might go up though. Maybe not human catapults, but human caterpillars or, better still, human centipedes. The migrants can form human centipedes as they travel from mascot to the city and beyond (wherever their fake education and illegal jobs are based). I love a really packed train. If you position yourself right you can have lots of fun! “Oh, umm, sorry, it’s the packed train, I had no where else to look and/or put my bits against”. LOLOLOL. Fun times. (I need a trip to Japan, would satisfy so many desires in one train ride). Try Italy, my wife gets he bum pinched all the time… mind you, don’t blame. RT – I’m sure that your wife actually asks for it. Otherwise she’d be wearing a full burqa to signal that there is to be no funny business. Anyone dressing like a h00ker (ie not in a burqa, or at least a chador) clearly wants and invites those sorts of advances. We have learned this from cultural exchange. Catch up, mate. the technique or process of taking a rubbing from an uneven surface to form the basis of a work of art. the practice of touching or rubbing against the clothed body of another person in a crowd as a means of obtaining sexual gratification. …thought you might be into a far more complicated form of strap hanging ….. Rack as in rack and pinion, or as in rack of ribs? Sydney (and MEL) transport destiny has not changed fortunes, it just reached its designed destiny faster due to the excessive immigration. When city planners actually do their job, carving out the city to make for new public infrastructure is result of opposite of planning. “We just need to plan better” ahahahhahahahahahahah! that “solution”, if it ever was a solution, lies too far back in time to be of any relevance. We need to actually plan with long term (a century) and not develop infrastructure reactively.. Some cities with decent infrastructure have planning that projects 50-100yrs estimations and are not reactive. Australian city planning is mostly reactive. Particularly in Sydney. While I normally agree that there needs to being better planning, the point is the horse has bolted, esp our major cities and We’re at least 30 years behind. Have to agree with peachy here in a sense. The track record for planning doesn’t exist here. Sure, I support more public infrastructure that doesnt end up as another Transurban ticket clipping exercise but at the same time the vibrancy dial needs to come down from 11 to about 2 and that’s the easiest logical fix in the interim. I did not offer a solution and my response only proposes a key ingredient required for any solution chosen. I offered a conclusion on failure pathway that lead to today’s problem (not being the immigration level but rather the pathway chosen in the last 50-100years of planning methods. From this it also derives that long term future planning has to begin and never stop to allow a solution at some stage. A sensible solution might be to have ZERO immigrants allowed in for, say, the next 10 years. We can then take 3-5 years to do some very thorough planning (and costing) and the next 5-7 years to start implementing the plan (spending the money, digging the dirt, pouring the concrete). In 10 years time, if it looks like the planning is “working” and residents living standards are much improved, we can test-import a small quantity (say 10,000) migrants, and see whether we can digest them… and so on. I stopped reading when you put sensible and zero immigration in the same sentence. As much as that would be a quick solution it is not sensible and neither is realistic. If anything, negative metro migration (and regional promotion with real offer of a better life) may be sensible to some extent. Planning 50-100 years ago isn’t exactly a sensible solution either djenka. You are talking about a government that can’t even lay down a tram line . You have a lot to say re that I ‘embellish or make up things’ rather than facts. On this forum I have posted many times the links or references to establish my opinions are fact based. As any google search or look back will show. I think you need to familiarise yourself with the facts which can be verified & consider updating your views. Non resident TR / Migrants guestworkers are not a race. That they are primarily unskilled & of third world origin is not a racial attribute. The article/topic is crush load of Sydney transport & trains including Mascot / new migrants as example etc. My comment was to underlying causes of that crush load and congestion across the wider network and all those observations are genuine, and easily verified. The 2nd point was that the Opal card with registration and tracking would provide an exact view of that including a user pays & infrastructure funding system that is more appropriate – currently the migrant guestworkers – many who work illegally or in the cash economy do not provide funding for new transport infrastructure. What fact do you challenge as embellishment exactly ? Dec 2018. Easily checked on DHA or Visasure or many other sources. Go to the ABS or DHA website. ▪️And we do have an estimated 440k migrant tourist visitors working illegally (5% of the 8.8 million tourist visitors yearly – in the 2015 Parliamentary submission on migrant guestworkers and the special taskforce set up by the ABF. That = 2.8 million non residents dec 2018. The vast majority – over 2.4 million third world unskilled migrant guestworkers, clearly evidenced by their visas category (95% are on non skilled visa categories) and 89% are of third world origin. That at least half in visa breach or on a visa pretext, only here to work illegally has been documented befits on MB with a detailed breakdown – and Macrobusiness itself & the extensive media on visa racketeering confirms all this – 75% or 505,000 of the 672,000 foreign students work illegally (SydU / UTS study) the skilled visa, bridging & protection visa, working holiday visa rackets & widespread fraud. Do you dispute their facts & evidence as well? Simple clear objective facts, with extensive verification. and the congestion that the article describes. And again – as any personal observation in traveling in these areas will confirm. So my suggested answer was to analyse map and charge those migrant guestworkers. We know as fact that many work illegally and make no taxation or social infrastructure contribution in funding any additional capacity investment. But it isn’t. It’s factual reality. And any observation confirms this. So linking your statement of ‘we have Excessive Immigration that has consumed infrastructure ahead of its planned capacity’ to the attributes of that excessive immigration’. My point was analysis can be easily done to confirm this (Opal card registration to identity resident or non resident attributes). And the simple but significant point that the ‘excessive immigration’ and peak / crush load is of new migrant non resident guestworkers whose attributes are that they largely in the cash economy, many working illegally & they DO NOT fund the cost & expense of the additional infrastructure capacity required. So the suggestion of a non resident registration and a specific Opal card for them that covers the cost of their transport usage & that extra infrastructure capacity they are or will consume is fact based, logical, without bias & more than reasonable. I like your work and I know what you say you truly believe even if it is an attempt to deliver it as an alternative version of Reus. The Sydney system is already past full capacity (if the standard is safe quality transport). On my line the trains are full at 6.30 am (ie no seats) and crammed full (lucky to get in the door) from 7.00 am to around 9.00 am. Yet there are massive numbers of apartments (5,000 to 10,000) just being completed around upstream stations that (if ever occupied) will dramatically increase demand. In the near future I expect I will need to be on the station by 5.30 am to get in the door. (Or will they introduce Japanese style “pushers”?). And heaven help travellers if ever there is a fire in an underground train or station. The stations struggle to handle the human traffic at present, in an emergency it would be chaos. The alternative to Japanese style “Pushers” is to have Indian style grab-rails on the outside and roof of the carriages. That might get a bit messy in the city circle tunnels. not a lot of clearance. Our politicians only need to travel to Singapore to see a modern, efficient, workable railway system. There is no excuse for our politicians to deliver the mess they have delivered. And there is no excuse for any voter who votes these cretins back into power. None. Andrew was on the way to investigate the workings of the Singapore system and stopped over in HK on the way, to check theirs. Then he got distracted trying to root some sheila and remembered that he didn’t really care about trains anyway, because he can just pilot an aircraft if he wants to go somewhere. God, what happened to Macrobusiness? A lot of the more colourful commenters disappeared in “the purge”. Having experience as a Transport Planner, despite being expensive (and unneccessary if we cut immigration), NSW Liberals metro lines will alleviate the existing double decker train network. NSW Labor stupidly wanting to cancel the Bankstown Line metro conversion will ensure ongoing capacity and reliability issues… They have no vision for the state and poor transport policies. Gladys to win imminent state election. “So my suggested answer is to analyse map and charge those migrant guestworkers in funding additional capacity investment.” But it still misses the point, why are these migrants here? Why are they avoiding tax as you state? Who are the free loaders? Its not the migrants they are the response to the problem. Where are the true free loaders….they are setting the immigration agenda, the are giving the nod to this. Who is the user of the migrants who isnt paying a goddamm cent. That is the question and its where the fix exists. Because your anecdote tends to support rather than refute his statements. I was once a fully paying member, but given the quality of moderation here, I cancelled it. I not censuring here, i’m calling it out for what it is. the case can be made without reference to race, and without the unbased claims. The claims are well based with fact & statistics. 2.4 million Temporary visa holders aren’t a race. It’s a fact we have 2.4 million non residents onshore. 92%,who are third world & unskilled isn’t a race. (See the DHA websites of country of origin & visa / skill categories – Every time i post a Dept of Home affairs visa & country of Origin data link, the comment gets moderated). It’s a fact. Or the 1.4 million on a pretext visa or in visa breach working illegally. Extensive evidence to that posted before with references. And that’s not a race. Of the 672,000 foreign students & partners across a spread of visa categories with 75% or 505,000 working illegally (only paying $8.2 billion in fees from money earned here, while creating a $9.2 billion unemployment cost of Australian & PR jobs they stole..) that’s not a race. The 440,000 illegally working Tourist Visitors (5% of the 8.8 million Tourist Visitors yearly – DHA parliament committee estimate) is not a race either. The non resident migrant guestworkers are clearly is dominated by ethnic groups in the migrant country of origin. But it’s not a racial issue & never was. And the 1.9 million PR migrants & new citizenship grants – legal residents, most who are lower socioeconomic & unskilled – they are the most impacted by the TR & tourist visitors working illegally. They aren’t a race either. And those PR want it fixed / reduction as well. Go ask them, I deal with hundred / thousands of them. It’s the PR jobs, wages, housing, standard of living & opportunity that the 2.8 million migrant guestworkers destroy first. Then Australia youth, unskilled, mature age. It’s why we have 1.1 million unemployed. 1.3 million seeking work, 116,000 permanent Australian homeless, 360,000 with no affordable housing, lower wages, decline in gdp per Capita, congestion, a destroyed education system and a huge foreign run underground black economy – dominated and its epi-centre the 2.8 million TR & Tourist Visitor imigrant guestworkers. It’s a border control, visa racketeering, lack of visa enforcement, intake quality & volume issue. And it won’t be sorted out by either major political party who maintain this influx & degradation of Australia and Australians (including the 1.9 million migrant resident PR) despite the majority of Australians including many of the new citizens & PR wanting it fixed. That’s why it needs a Royal Commission. To override the corrupted political parties(both of them) and the vested interest business, education & real estate self interest and to fix this. This sort of low integrity disingenuity is why you’re not going to convince anyone with your screeds who doesn’t already agree with you. She said it was foul and smelled foul, which is its nature, but it would make me smell equally the same if I stepped on it. Stepping on it will not change its nature. OTOH, pointing towards one will prevent others from stepping accidentally on it. It seems as if you jumped to stomp it and now wonder why there’s splatter everywhere, your shoes are ruined and the stink follows you. Ha ha, so that’s your style? Rather than deal in facts, or offer any credible constructive alternative view – you block your eyes & ears and deny it. Isn’t that cognitive dissonance on full display? 😊. The ‘pile of poop’ as you say doesn’t go away just because you ignore it or pretend it doesn’t exist. I don’t think I’m jumping in it – just pointing out it exists. Maybe you should bend down, have a good sniff, examine it as a reality & help try & clean it up.. I do suggest you, like a few others here get out of your bubbles & travel around Sydney- particularly the south, inner & outer western suburbs before you comment. And it’s not a race issue or even a bias. It may surprise you, but I have dealt with thousands of migrants ; PR / TR here in Australia & overseas. The scale of the criminal fraud is staggering. The intake quality is shocking. And it may also surprise you but it’s not just Australia born who want a fix to the migrant intake impacts / esp the TR & illegally working Tourist Visitors,but the new migrant Citizen grants & PR as well. The new citizen migrants on citizenship grants & PR are perhaps the biggest victims of our broken borders & visa corruption.